Songs - It's Showtime! revue - Part II: IF FEET COULD TALK; PLAY IN A RHYTHM BAND; IT IS TO LAUGH; GIVE WITH YOUR HEART; MILES OF SMILES. Other music: (THERE'S A) LITTLE WHEEL A-TURNIN' (Low D, G, A, B, D); FREDERICK DOUGLASS; WINTER MAGIC; TELL US, MR. GROUNDHOG; BUILD A TACO; DON'T LET YOUR PHONE RING; AUSTRALIA; NOBODY KNOWS THE TROUBLE I'VE SEEN (Low D, E, G, A, B, D. OPT. PT. 2 Low E, G, A, B. ALTO PT. B, C, D, E, G). Articles - It's Showtime! Script, It's Showtime! 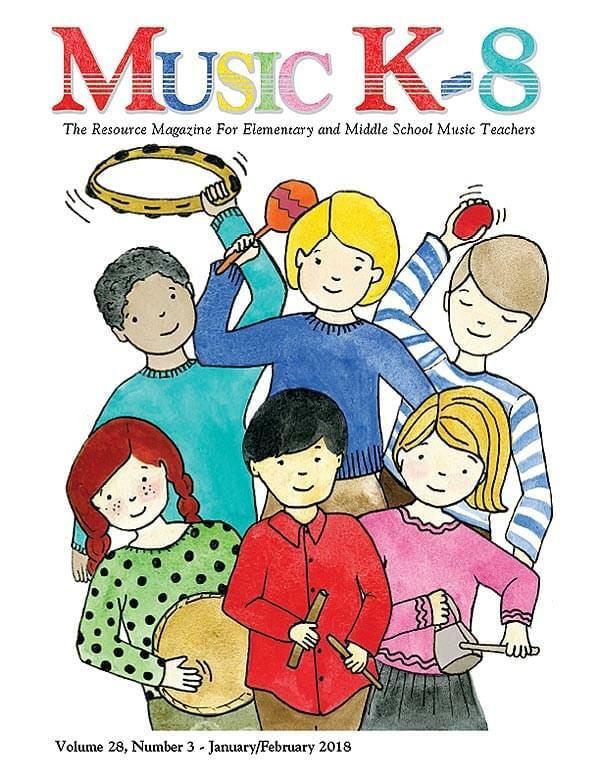 Teacher's Guide, Network, About the Rest of the Music in this Issue, Resources For January & February, Photo Journal, and more!